No longer available. 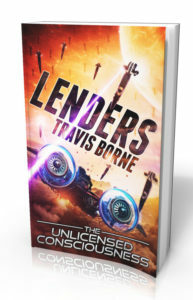 Lenders: The Unlicensed Consciousness is getting re-released! Coming before Christmas 2018: 1,400 pages—450K words of adventure! Get ready to explore myriad dream worlds in Lenders saga. Two massive 700-page novels! Lenders II: The Time Tribulations. Imagine a world of possibility, and the empowering technology of artificial intelligence—THE FUTURE! Experience the past where it all began, and the future where all could end! LENDERS! A new saga you will never, ever forget. But it’s no picnic and what must be done is not for the faint of heart. Very few can do it successfully, or stomach it, until Amy comes along. She’s special, but not for any reason you’d imagine. Jump twenty-five years into the future where the last of humanity survives in the last city, a quaint town surrounded by a great wall. 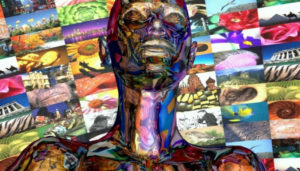 Science is limited, except in the facility where technology stabilizes the world of dreams, where consciousness itself is harvested in exchange for protection. When the unexpected happens Jim is faced with a gut-wrenching decision that could change everything. But it’s what his malcontent self had always wanted, right? Travel beyond the solar system, through wormholes, into The NOTHING—The SOMETHING as some call it, then explode out; to the edge of the universe, realms unrecognizable—and depending on his choice, possibly into a world of doom purposed for the unimaginable. Is it really just a dream, a MAP as labeled by Ted and the other scientists? Journey into a vast desert with mezcal-drinking Felix in his clunker pickup where secrets run deep. Meet Mister Quain Renmore in a world unimaginable; he wants to disclose more than he’s allowed to—beware of his slaps and kicks. Push the boundaries of the system, testing its limits with newfound powers. Will it burst through causing the ultimate surge, or is it already too late? And will it even be enough to save them—the drone army has already punched through the defenses! Head to the safe room, pack in tight while Amy, Jim, and the lenders battle against all odds to pull off the impossible. Lenders Saga I: Experience the beginning where it all started, 25 years ago. Powerful companies race to develop AI, and one man with a prescience greater than your typical mortal. He manages something special by working nearly 20 hours per day. He’s rudely blunt and tells it like it is. But can he tear down the walls that hold him prisoner to a world of hate? Will he realize, he doesn’t have to go through this alone. Hatred forged from years of abuse and mockery, once a nerd but now a king, haunted by terrible speculations of a perspicacious mind he knows things will take a turn for the worse and decides to unfold a chair, pop open a beer and watch it all burn, but now…has everything changed? He finds someone special across the border in Mexico, but can newfound love assuage the demons raging war inside his mind. His immense mental capability is balanced by a terrible trio that bullies his rational and sanity. With a select group of friends and a rescued heart, will he alter the plans? While there can be no stopping the coming destruction, could he and his team pull it off anyway? Maybe, with the assistance of another very special mind. Horrific terrors delivered to your spine, encounter myriad dream worlds, learn lessons from goodhearted characters like old Nanny at the fair, laugh at red-headed Myron, Amy’s wacky chainsaw-wielding school buddy going ballistic on tourists in the canyon map. Cry when new love is born, also cry when trust is shattered. A warning to all readers: attempt to retain your lucidity while things snowball for civilization, fires rage, and volcanoes vomit. Bear witness to mass destruction on a comprehensive scale—but just as the lights are about to go out for good: along comes Jim, Amy, Rico, and the lenders, assisted by head scientist Ted—in the future; Herald, the love of his life, and his friends—in the past. Can Herald and his team outrun the approaching nightmare in the hover-jet? Can Amy and Jim slip through where all others have failed? Will a species prove itself worthy? Will a beacon for intergalactic assistance be heard, and if so will it arrive in time to save the final stragglers? Note: Lenders is coming soon. Lenders I is getting re-released, and Lenders II will be making its debut. Soon to be available on Kindle. Lenders I and II. Coming before Christmas 2018.